Fluke Electronics would like to present you with this handy refrigerator and freezer thermometer. 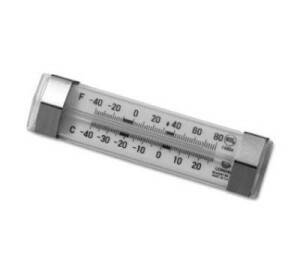 This refrigerator and freezer thermometer is ideal for making sure your cold kept foods stay at the correct temperature for safety and quality. This refrigerator and freezer thermometer has a temperature range from -40 to 80 degrees so that you can keep track of unsafe temperatures. The tube is a non-toxic spirit filled tube and hangs or stands depending on your preference. Refrigerator/Freezer Thermometer, non-toxic spirit filled tube, temperature range -40 to 80 F (-40 to 27 C), hangs or stands, NSF.